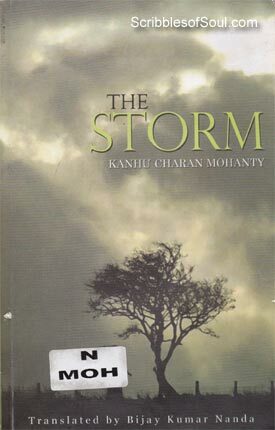 The Storm by Kanhu Charan Mohanty, was originally titled as ‘Jhanja’ in Oriya , and written in 1949, by one of the most voluminous writer of Oriya Literature. However, as expected, the regional writer remained in the obscure shadow for more than six decades, until Bijay Kumar Nanda chose to translate this mega story into English and presented a rare opportunity for people like us, to spend some time with Kanhu Charan’s idealistic take on love, charity and pretensions! Ever since I read Dawn, I have been enamored by the hidden talents vested in our regional little known writers. And, as I began reading Storm, I found a similar brilliant streak rippling though the present book as well. The story began with Kshanaprava, looking out of the window wishfully on the festival of Dola. But, in stark contrast to joyous occasion, Prava was seriously worried for her blind husband, Tusharkanti, who once had a promising Govt job, but was now penniless, forced to give tuition to arrange meal for his family. As the story progressed in a strange mix of sentimental flashbacks and unrealistic ideals, several characters including, Kshanaprava’s ex-admirer Dushmanta, and her father Parsuram were introduced. As Parva and Tushar struggle to eke out a living, one night, Dushmanta’s car hit the rickshaw, in which Tushar was coming home, thus injuring both Tushar and the poor rickshaw puller, Kalu Samal. That fateful stormy night reignites the flame of friendship and intimacy in Dushmanta’s heart, and by a curious turn of events, his mother Sukanti convinces Parva to move into their ancestral home. The change of place translates into change of hearts as well. Dushmanta gives away half of his property to Tushar, supposedly to run Home for the Destitute, an ambitious social welfare scheme, that is supposed to give the lame, blind and deaf people a new lease of life. With the opening of this institute, the characters were transformed. As Parva becomes a charming social activist, Tushar a dedicated manager and Dushmanta, an aloof sponsor, several institutes for education and emancipation of sick and backwards were opened left, right and center. It appeared as if there began a race among the protagonists to earn the coveted title of present day “karna” and prove themselves to be the biggest philanthropist, without even once thinking about their personal lives. As Kanhu relentlessly engaged in making martyrs out of ordinary men, I began to lose interest in the story. The novel had become a bit too philosophical, every character seemed to so be pure hearted, that he is ready to sacrifice his wealth, body and reputation for the comfort of poor and needy. The social work was done at hectic speed. Each one of them opened institutes for the disadvantaged. And, it all came across as utterly impractical and unrealistic. It is not that I have any problems with idealism. In fact, I have always liked Tagore’s philosophical works, particularly Gora, where pages after pages were dedicated to Brahmo v/s Brahmans debate. But, Rabindranath was always able to keep the discussions interesting. To give a life like feel, he kept his characters realistically grey. They had their own shortcomings and came across as real people, not the polished prim white caricatures, I could see parading in Storm, with a holier than thou aura. Though, I tried hard to convince myself that perhaps in India’s nascent freedom, all the citizens were actually inspired to do good work, creating an all enveloping feel of universal brotherhood. But, still, the novel had begun to bore me. But, thankfully, in the second half, a dramatic change was brought in the plot through the poor rickshaw puller. As Kalu smirks the wisdom of rich, in building a fancy jail for the poor, and Parva laments her fall from a devoted wife to an exhibited doll, I began to understand that Kanhu is actually a first rate satirist. He exaggerated the sympathetic social work to such a great extent, that it became a farce, with characters coming across as hollow caricatures, who took their masks a bit too seriously. And, then very strategically, he began to dissect the real characters of each one of them, exposing the naked devil lurking beneath their misleading white garbs. Tushar, whose pride was hurt by Kshanaprava’s request to do a honorable job, does not blink an eyelid, while shamelessly asking Parva, to collect donations for the institutes, by using her womanly charm and beauty. And, still he has the audacity to abandon her, by placing her on the high pedestal of a noble woman, whom he may call his best friend, but who was too low to be accepted as wife! The benevolent, good hearted Dushmanta, who was moved so much by the plight of his blind friend, Tushar that he donated him half of his property, did not even once inquire after the poor Rickshaw puller, Kalu Samal, who was handicapped by his own mistake and was reduced to penury! Talk of double standards and the man fits the bill perfectly! Similarly, there is Parvati, who comes across as a very bitter woman, a plotter, who estranges Parva from her father. She even abandons her husband Parsuram, when he in ‘a fit of madness’, gives up his paternal property. Parvati could not digest his overt kindness, and returns to her paternal home, as supposedly, she was married to the riches of Parsuram, not to the toothless old man, he was now! But, the same Parvati, who was against any crazy social work and was unable to accept her step daughter, in her infatuation towards the benevolent doctor, becomes the sole proprietor and manager of an orphanage! A perfect instance of unparalleled magical transformation by a cursory touch of romance! So, a tale that initially abounded in lifeless characters, was suddenly transformed into a multilayer story. As I discovered the hidden meaning, my interest was revived in the story, and I began to notice the love triangles, as many as four of them, scattered amongst the long winding debates and complex monologues. The novel does have much more than is apparent at the first look. It is an intricate work, where subtle hints are given to the readers, with a chance to enter the minds of its characters. I would call Storm, a psychological study of human mind and action. Kanhu in his mesmerizing, at times obscure and most of the times, brilliant narrative, gives an insight into the innermost recesses of our hearts. Each man thinks his own scheme to be brilliant, and is able to point out a hundred shortcomings in the others’ plans. Everyone tries to put across his own argument, considering it to be perfect, while deftly denying others’ ideas, even before making an honest attempt to understand the same. It is never easy to argue from both sides, and it is to the credit of Kanhu Charan Mohanty that he has dealt with not just two, but a multitude of social reforms, expounding on the vulnerability of each. He has exposed the selfish man hidden beneath the garb of generous donors, good hearted social workers and aggressive communists. The final message is to give up pretense and follow your own heart. At last, each of the character becomes content only when they give up false semblance and relocate to the places and people they love the most. As Dushmanta goes to a tribal village, Parva to his father’s social village, Parvati in her orphanage, and Kalu in the innocent warmth of Duli’s illegitimate son. The novel is rich in metaphors and symbols, especially storm and rain, as they accompanied great turmoils, tragic events and sudden transformations, giving physical dimension to distressed mental state of the characters. Then, there is the character of Debaraj/Dhoomketu/King Sagar, multiple avatars of the same social worker, who helps to break the illusion of charity, by his own self less work. The festivals were also used in an impressive way to contradict the outer happiness and inner joy. For example, the story begins on Dola and ends on Badaosha, two major Oriyan festivals, supposed to bring happiness in life. But, while in the beginning, sombre Prava is worried about her poverty, lamenting the loss of her good fortune. In the end, the same Prava has willingly abandoned riches, and is ecstatic in her old clothes, cracking jokes with girls of her village, emphasizing the never ending circle of life! In short, if one can bear the long winding discussions and a somewhat hazy timeline, I think, The Storm is a good attempt at creating a perfect potpourri of idealistic propaganda, intense love triangles and thought provoking realism! KANHU CHARANA HAS BEEN CREATED MILESTONE IN ODIYA LITERATURE. ALL ODIA SHOULD KNOW ABOUT HIS CONTRIBUTION FOR ODIA LITERATURE.